Sometimes as a parent you hope and pray that the life lessons you are trying to teach your babies are sticking. Over the last year and a half the lesson for our family has been consistent. Consistently that everything happens for a reason and that God has a plan for every event and that we should not worry over everything and just trust him. This is our way of making it through deployments sanely and this last deployment brought it to the front. It was a daily discussion in our house. This last deployment they were old enough to understand this idea and truly live by it. It is the only way we made it through this roller coaster of a PCS from Kansas because only God knew what was going to happen with us because we sure had NO idea :). It is easy to forget when things are going good and not remember when things aren't going the way you want them too. Well JT just learned this lesson again and is a good reminder for all of us. He wrestled all season and did a great job of switching from Jitz to wrestling. He was finally getting comfortable with the wrestling rules and style and was preparing to have serious wrestle offs to make the state team. 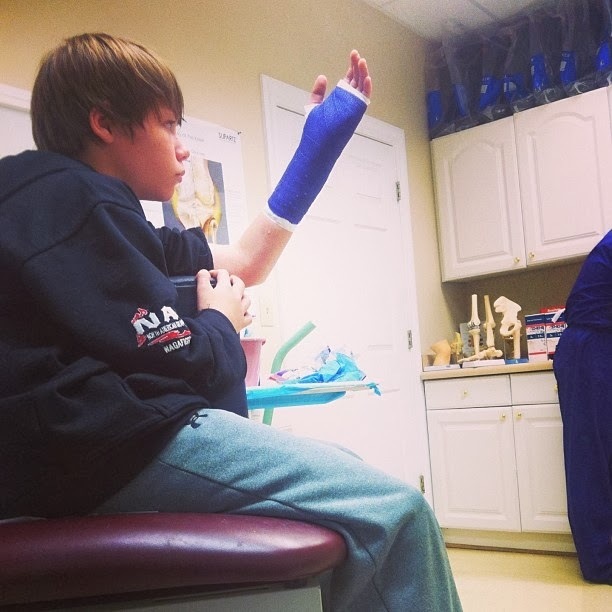 Then came Thanksgiving :)...he of course breaks his hand blocking a move that normally would do nothing. Fast forward a couple weeks and he is done wrestling for the Middle School due to not being able to compete in wrestle offs. In the mean time, he has the opportunity to play with 8th grade band at festival which requires him bringing home his instrument (not an easy task on the bus and one that Stephanie says I am never allowed to make him do LOL). This lesson has officially sunk in because he has realized that by him not being able to be on the MS team he now has time to 1. Bring home his baritone and practice, 2. go to jitz twice a week (which is his true love and something he truly needs in his life) and 3. he will still be able to wrestle twice a week with USA and I can fit my school in around all their schedules by this happening. I am so thankful that one lesson we are trying to teach has officially sunk in. Instead of being super upset about not being on the MS wrestling team he turned around and said "Its ok because there is a reason for it." Never in a million years would I have imagined my 12 year old to tell me it's all good because there is a reason because I wouldn't have been able to do everything and you wouldn't have been able to take your late classes as easy. Praise God that my children are truly learning to depend on him and not let life's roller coaster ride get the best of them at an early age. Thank you for visiting my Blog! Please feel free to leave a comment or two. Life is very busy and full of new adventures everyday when it comes to our household. I never know what each day is going to bring. I just pray everyday that God will give the me strength to handle the challenges set before me and the wisdom to give him praise during those times. I am a busy mom of 3 little rugrats; JT-12, Savannah-10, and Jake- 8. My husband is in the Army. We are now enjoying the North Georgia mountains. Who said the best things in life aren't free? Its my life Dont tell me how to live it. LOST IN THE WOODS WITH NO WHERE TO HIDE!